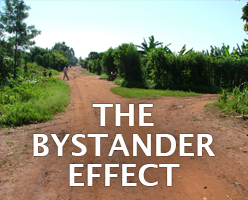 In this activity, students will develop an understanding of what it means to be a bystander and its potential impact in the context of the Genocide against the Tutsi in Rwanda. Students will watch a number of testimonies from witnesses to and survivors of the Genocide against the Tutsi in Rwanda who describe the consequences of the bystander effect in their own lives. Students will construct a social media message for the #BeginsWithMe campaign that describes their own plan to counter bystander behavior.